As per Microsoft, "This certification exam measures your ability to plan and maintain a Microsoft Windows Server 2003 network infrastructure...." This distinguishes it from Exam 70-291, which measures " your ability to implement, manage, and maintain a Microsoft Windows Server 2003 network infrastructure. " Have you got that? What's clear to us is that there is a lot to know about Windows 2003 Network Infrastructure. It may be that Microsoft was kind enough to split the material up to make it easier for everyone to pass both exams on the first try. On second thought, maybe not. It's best to prepare for however Microsoft decides to test those seeking to become certified. 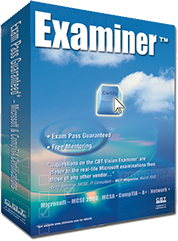 CBT Vision's Examiner test prep software is designed to help you to prepare for and then pass your certification exams the first time. We guarantee it. The software and support package for exam 70-293 includes Free Mentoring, solid questions and innovative testing technology. These features are actually part of every Examiner we sell. Examiner will prepare you to wrestle with the 70-293 topics summarized below. Don't let the Server Roles part of this skill set fool you. This area means to test your security smarts. You will need to be able to plan a secure baseline installation. You will need to be able to plan security for servers that are assigned specific roles. Roles might include domain controllers, Web servers, database servers, and mail servers. Security templates may be based on server roles. You'll need master security templates in general. You should be able to evaluate and select the operating system to install on computers in an enterprise or just about anywhere else. Planning and modifying a network topology so that the physical layout and protocols are well chosen for the network. Planning an Internet connectivity strategy. Planning network traffic monitoring. Tools might include Network Monitor and System Monitor. If things don't go according to plan, you'll need to troubleshoot connectivity to the Internet. This involves checking Network Address Translation (NAT), name resolution cache information and client configuration. You may also need to troubleshoot TCP/IP addressing as it relates to client computer configuration and DHCP server address assignment. Planning a host name resolution strategy involves DNS namespace design, assessing zone replication requirements, taking a look at your forwarding configuration and addressing DNS security needs. Along the way, you will also need to examine the interoperability of DNS with third-party DNS solutions. Nowadays, planning a NetBIOS name resolution strategy typically involves a WINS replication strategy and a careful look at the LMHosts file. If your best-laid plans don't quite pan out, you should be able to troubleshoot host name resolution. This involves diagnosing and resolving issues related to DNS services and client computer configuration. Plan a routing strategy by specifying the correct routing protocols to use in a specified environment and planning routing for IP multicast traffic. Plan security for remote access users. This includes remote access policies, protocol security requirements and authentication methods for remote access clients. Implementation of your plan entails securing access between private networks by creating and implementing an IPSec policy. Your planning efforts should result in your server be there for clients when they need it to be there. Planning services for high availability means that you had better know how to implement clustering services and Network Load Balancing. Bottlenecks to battle include memory, processor, disk, and network related bottlenecks. Tools to use in the battle include System Monitor. Be able to implement a cluster server and recover from cluster node failure. Identifying appropriate backup types. Methods include full, incremental, and differential. Planning a backup strategy that uses volume shadow copy. Planning system recovery that uses Automated System Recovery (ASR). Configure network protocol security. In a heterogeneous client computer environment and use IPSec policies to do so. You should have no trouble configuring security for data transmission using IPSec policy settings. You'll need to demonstrate an ability to plan for network protocol security by specifying the required ports and protocols for specified services and creating IPSec policy for secure network communications. Your skill set should include the ability to plan secure network administration methods. These methods may involve Remote Assistance to client computers and remote administration by using Terminal Services. Plan to see a question or two on wireless network security. Plan to secure data transmissions between client computers to meet security requirements. Don't be surprised if IPSec figures prominently into the recommended plan from Microsoft. Configuring Active Directory directory service for certificate publication. Planning a public key infrastructure (PKI) that uses Certificate Services. Planning a framework for planning and implementing security. Planning a security update infrastructure. Tools might include Microsoft Baseline Security Analyzer and Microsoft Software Update Services. For a list of all the topics you need to know to pass this exam you can visit Microsoft's official web page for the 70-293 exam.